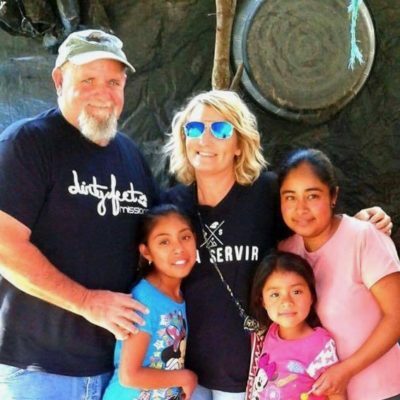 Genia O’Neal, founder of Dirty Feet Missions, began her mission experience in 1991 as a Youth Pastor. During her 22 years of ministering to teenagers and the 25 trips that she managed, a passion for showing the world the unconditional love of Christ evolved. It was also on these trips that she realized the transformation that takes place when a person realizes that there is more to life than self, it is about doing something for someone else without the expectation of anything in return. In September of 2011 Genia knew that missions was to be her new focus. Dirty Feet Missions was birthed out of a desire to develop long term relationships with people from all walks of life and introduce them to the adventure of missions. Genia lives in Bryceville, Florida with her husband of 42 years, Eddie. They have 3 grown children. Eddie Jr, Lindsay and Brooke and 5 grandchildren.